References m_hBitmapAbove, m_hBitmapBelow, m_hBitmapHoriMid, m_hBitmapLeft, m_hBitmapRight, and m_hBitmapVertMid. References destroy(), hori_left, hori_mid, hori_right, AP_Dialog_SplitCells::m_answer, AP_Dialog_SplitCells::onSplit(), AP_Dialog_SplitCells::setSplitType(), UT_DEBUGMSG, vert_above, vert_below, and vert_mid. References _DS, _DSX, BITMAP_HEIGHT, BITMAP_WITDH, XAP_Win32DialogBase::centerDialog(), Color, XAP_App::getStringSet(), XAP_StringSet::getValue(), m_hBitmapAbove, m_hBitmapBelow, m_hBitmapLeft, m_hBitmapRight, XAP_Dialog::m_pApp, XAP_Win32DialogHelper::s_loadBitmap(), AP_Dialog_SplitCells::setAllSensitivities(), and XAP_Win32DialogBase::setDialogTitle(). 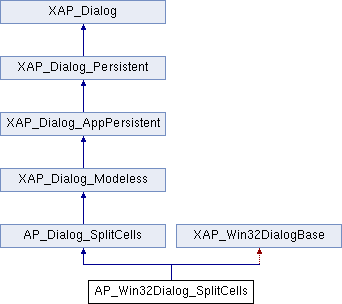 References AP_Dialog_SplitCells::ConstructWindowName(), AP_Dialog_SplitCells::m_WindowName, AP_Dialog_SplitCells::setAllSensitivities(), and XAP_Win32DialogBase::setDialogTitle(). References AP_Dialog_SplitCells::finalize(), XAP_Win32DialogBase::m_hDlg, and UT_ASSERT_HARMLESS. Referenced by _onCommand(), and event_Close(). References AP_Dialog_SplitCells::ConstructWindowName(), XAP_Frame::getFrameImpl(), XAP_Win32DialogBase::m_hDlg, AP_Dialog_SplitCells::m_WindowName, AP_Dialog_SplitCells::setAllSensitivities(), and XAP_Win32DialogBase::setDialogTitle(). References AP_DIALOG_ID_SPLIT_CELLS, XAP_Win32DialogBase::createModeless(), XAP_Dialog::getDialogId(), XAP_Dialog::m_id, XAP_Dialog::m_pApp, XAP_Dialog_Modeless::m_pDialog, XAP_App::rememberModelessId(), AP_Dialog_SplitCells::startUpdater(), and UT_return_if_fail. References hori_left, hori_mid, hori_right, XAP_Win32DialogBase::m_hDlg, vert_above, vert_below, and vert_mid. Referenced by _onInitDialog(), AP_Win32Dialog_SplitCells(), and ~AP_Win32Dialog_SplitCells(). Referenced by AP_Win32Dialog_SplitCells(), and ~AP_Win32Dialog_SplitCells().